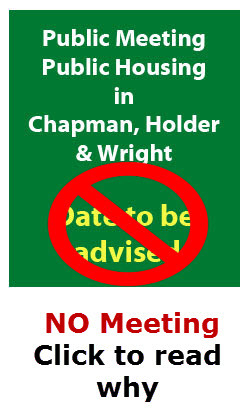 The Weston Creek Community Council meeting of last Wednesday 29 March had to be abandoned due to excessive attendance numbers. This was very gratifying in that we had reached so many members of the community. Unfortunately we were breaching the fire regulations and the club was required to ask us to terminate the meeting. There is concern that Taskforce staff may not be treated with respect and that there may even be abuse. We consider that action taken is a form of disenfranchisement of the Weston Creek community. The Taskforce has pointed out that the ‘Drop In’ session scheduled for Saturday 8 April would provide sufficient avenue for the community to make known their concerns and/or support for the 3 sites. They intend to extend the session to 3 hours and that bookings can be made by individuals and by small groups of up to about 6 people. As you can no doubt appreciate this will not allow comment to be made by 200 people ( the approximate number of people at the terminated meeting). However there is another avenue available to residents of Weston Creek !! Our fellow Community Council at Woden have a meeting on Wednesday 5 April at 7.30 pm in the Southern Cross Club. They have indicated that Weston Creek residents would be welcome to attend. There are two items on the agenda. Firstly the master /precinct plan for Woden Town Centre and then the Housing Renewal taskforce will present. Both of these items should be of interest to residents of Weston Creek as the Woden Community Council tries to ensure the revitalisation of our closest town centre. Of course the second item may also give us a chance to communicate with the Taskforce. We will endeavour to keep you updated and regret that the show of concern evidenced by the numbers at the Raiders Club meeting has resulted in the current situation. The real abuse and lack of respect comes directly from the ACT Government’s treatment of the Weston Creek Community! Their lack of communication, consultation and willingness to keep the community up-to-date with information shows a total lack of respect for the residents, many of whom have lived in this area for more year’s than the current local government has reigned. Perhaps they should reflect on how the residents feel rather than worry about a full and open discussion which they are trying to avoid at all costs. There is absolutely no transparency in this matter and we have a right to be upset with this totally inadequate process which I am quite sure breaks even the ACT government’s own “rules”. I find it interesting that the Housing Renewal Taskforce are concerned about being abused when meeting with the residents of Holder and Weston Creek in general. In the normal course of events where one assumes one has done a good job, the fear of abuse would be the furthest thing from the mind. I am disgusted by this gutless backflip. First they told us that we would be informed. We weren’t. Then they said that they would consult with us. They did not. Now they have actually told us that there will be no information or consultation after all. This is not good enough. I hope everyone from Weston Creek comes to the Southern Cross Club on Wednesday night at 7:30pm to ask the taskforce WHY they are trying to silence us rather than consult with us? My grandparents lived all their adult lives in public housing, spending about 20 years living in the Northborne flats. I spent a lot of weekends and holidays staying there with them. They did not like living in a such a large complex but it was all they could afford. They were relieved to live out the later years of their lives in seniors public housing in Hackett, where they had much more calm and quiet. The point here is that they were relocated in the inner north. This was their area, where they had always been and were provided with decent sized accommodation. I have also had many friends who have lived in public housing in the inner north. I can tell you they would not have been happy being uprooted from their community and prime location in the inner north with access to all its amenities just to be shunted out to the suburbs, with no support services around. All to make way for a tram, that they possibly could have used to access increased employment opportunities! Why are our most vulnerable not good enough for the tram???? This is very concerning. The community should be consulted and absolutely have a right to our say. I don’t understand why public housing is being built away from public transport and support infrastructure. Surely building public housing along the ‘fantastic’ and ‘needed’ new public transport system makes more sense. The very people who could make most use of the tram are, certainly in the case of the Chapman location, being moved to the outskirts of the suburbs. Research has shown that the salt and pepper approach has not worked in other countries so I wonder why this is persisted with. They are placing these people from mainly the Inner north in areas where there are no facilities to support them. If the facilities were there then it may be another matter but they aren’t and haven’t been. And of course there has been no consultation what so ever which is why the community is upset and rightly so.